A broken boiler can be a nuisance, especially in the middle of winter. If you’re reading this post, chances are you have a broken boiler or a boiler that keeps breaking down. Or you’ve suffered multiple boiler breakdowns in the past and are pondering whether you should keep spending money on repairs or finally look at boiler replacement. 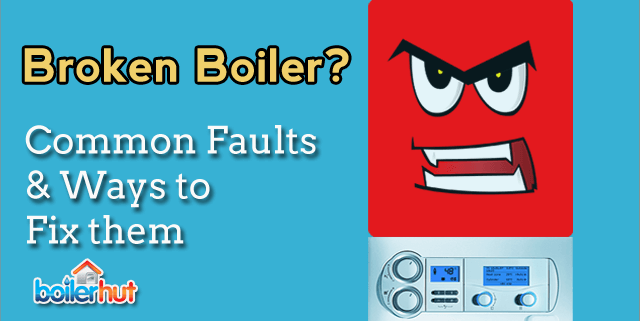 We’ve tried our best to compile all the common boiler problems and ways to fix them. If the pressure gauge on your boiler shows below 1 bar, chances are that is the reason why your boiler isn’t working. Boilers may lose pressure occasionally and can be re-pressurized using a filling loop located below the boiler. However, if your boiler keeps losing pressure consistently, it may be due to a water leak. It’s still not a broken boiler. 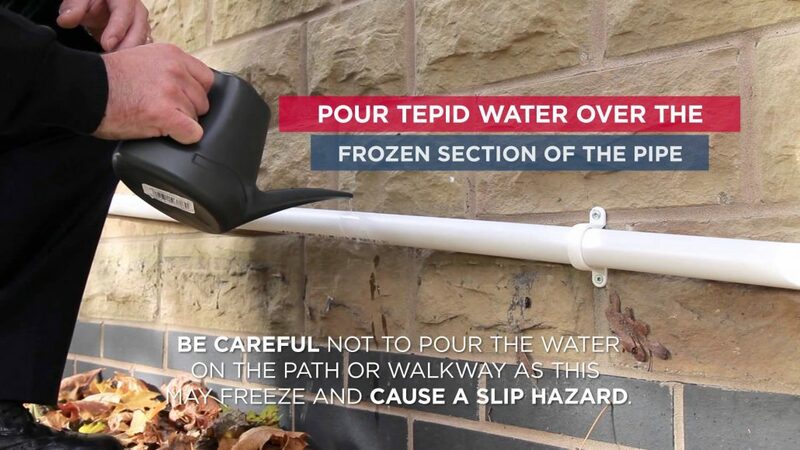 Check your radiators and your boiler for any leaks. This guide from Viessmann shows you how to detect any water leaks and repressurise your boiler. Was there a Recent Powercut in Your House? If your electricity cut out for even a few seconds, it’s most probably reset your boiler and messed up your programs. Relatively easy fix is to simply re-program your boiler. The boiler’s instruction manual should have easy-to-follow guidelines. If not, someone at your boiler manufacturer’s customer service center should be able to help you over the phone. If you have a prepayment meter, check if it’s run out of credit? Best way to check whether there’s gas going into the boiler is to check if other gas appliances in your house, like a cooker hob, are working properly. If none of them are working, chances are you need to top up or call your gas supplier. Also check whether the switches in your fuse box have tripped. Your thermostat may be set at too low a temperature. Depending on how you’ve programmed your boiler, it may turn your heating off if your room thermostat is set lower than 21 degrees celsius. This may seem like a broken boiler, and people tend to pick up the phone straight away, but it’s a relatively simple fix. Turn the thermostat back up higher than 21 degrees celsius to check if your boiler starts working again. If not, switch to manual, and for further tweaks refer to the manual, or finally call the thermostat manufacturer. If your boiler is older than 15 years, or if it’s an even older back boiler, chances are it doesn’t have the reset function. But a pilot light instead. In which case you may need to refer to its instruction manual, or call its manufacturer. Because back boilers are ancient, chances are either their manufacturers no longer exist, or they’ve ceased support. In which case you would be better off calling a local plumber or consider a boiler replacement. Check if your water supply is turned on, and then call your water supplier. In many cases, the risks associated with a broken boiler can go beyond just annoying sounds or inconsistent heating. It can be downright dangerous, and potentially fatal. If you ever suspect a gas leak, you should call the Gas Emergency Services and exit the premises ASAP. There could be a carbon monoxide leak, which can be poisonous and possibly fatal for anyone that breathes it in. What’s more, depending on how severe the leak is, the poison can have its effect over the long term or even shorter periods of time. After you breathe in carbon monoxide, it enters your bloodstream and mixes with haemoglobin (the part of red blood cells that carry oxygen around your body), to form carboxyhaemoglobin. Once this happens, the blood is unable to carry oxygen anymore, and this lack of oxygen causes the body’s cells and tissue to fail and die. As per the NHS, every year there are around 25 deaths from accidental carbon monoxide poisoning in England and Wales. The symptoms of carbon monoxide poisoning from a broken boiler aren’t always obvious, particularly during low-level exposure. 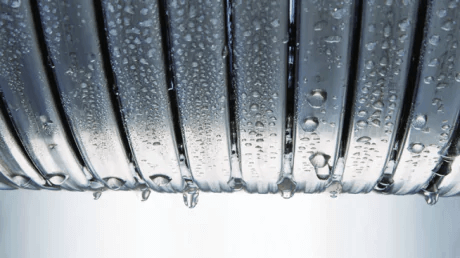 This can be due to accumulation of limescale on the heat exchanger which can block water flow and cause some of the blocked water to boil and expand like in a kettle. It’s important to get on top of this ASAP because it may cause damage to the internal components of a boiler. Which on top of regular thermal stresses on a daily basis isn’t good for longevity. 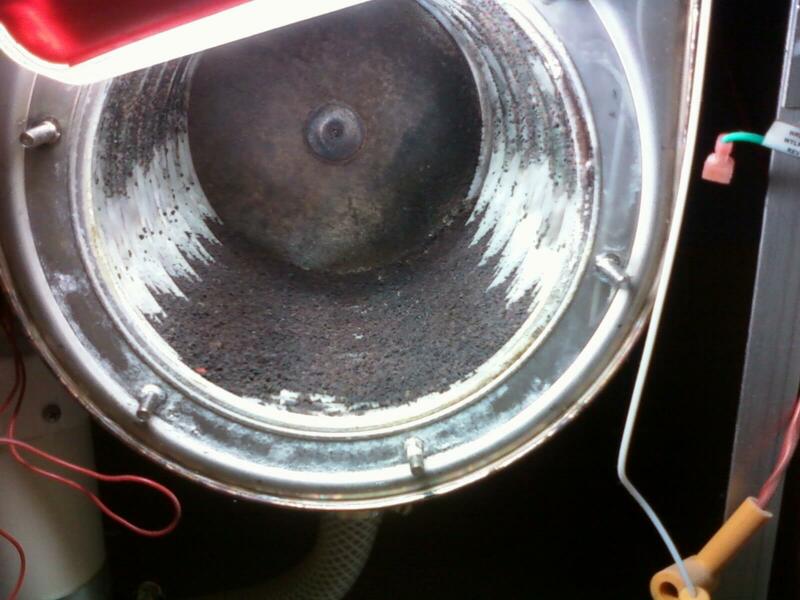 Regular annual boiler service can help avoid this on top of preserving manufacturer warranty. If your broken boiler is still under warranty, call the manufacturer. If not, a boiler technician or a plumber ASAP. For a whistling sound it may just be trapped air, which is easily fixable by a plumber. If your energy bills are higher than usual, chances are it’s because of the low efficiency of your old or broken boiler. If your existing boiler is older than 15 years, it’s most probably a non-condensing boiler. So, it’s at a lower efficiency level already compared to a modern condensing boiler. On top of that, over years a boiler’s internal components get corroded due to thermal stresses on a daily basis. According to the Energy Saving Trust, heating accounts for about 55% of your energy bills. And by switching to a condensing boiler, you can save between £300 to £600 per year on your energy bills. So, give boiler replacement some consideration. Quality of the metal used for the heat exchanger can make a huge difference to the overall durability and longevity of the boiler. Aluminium heat exchangers also require special inhibitors to maintain the system, without which there is a high risk of damage to the boiler. Annual maintenance is also required for removal of aluminium oxides, which can build up and can clog the condensate line. There can be high degrees of corrosion through aluminium oxide build-up and further erosion at higher flow rates. 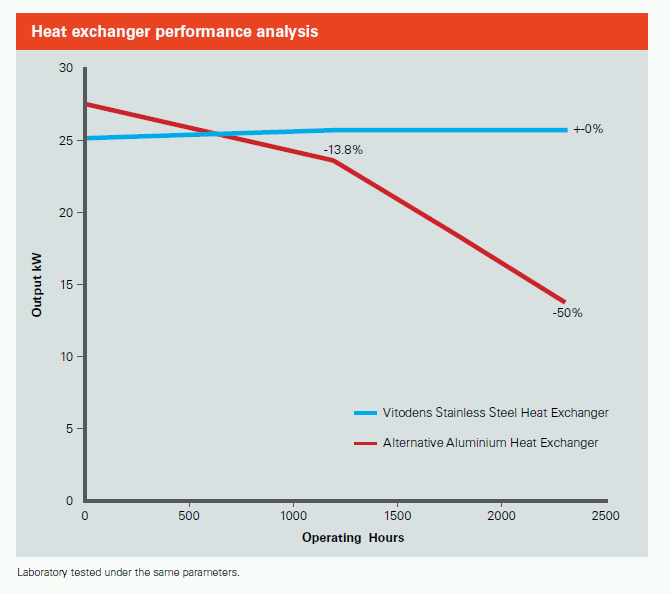 The diagram below shows a direct comparison for aluminium vs stainless steel heat exchangers. While aluminium starts out at slightly higher output, it drops down dramatically over years. So, if you plan on selling your house in the next 1-2 years, any cheap boiler with an aluminium heat exchanger will do. However, if you plan on staying in that house for many years to come, please consider a boiler with a stainless steel heat exchanger. Viessmann are one of the only boiler brands in the UK who have a unique, patented Inox-radial stainless steel heat exchanger. And because Viessmann manufacture the heat exchanger at their factory, they can compete at the same price point with their rivals in the UK, even though Viessmann boilers are technologically superior. Should You Repair or Replace a Broken Boiler? If your broken boiler is within manufacturer’s warranty or between 5-10 years old, it’s probably not worth replacing it (unless it’s a cheap, very low quality manufacturer). However, if it’s 12-15 years old and you’re paying for frequent repairs, it’d be a good idea to consider replacing it with a modern A-rated, condensing boiler ASAP. Because not only is your boiler out of manufacturer warranty, it’s running on older non-condensing technology. And because over years their efficiency drops down to 70% or 50%, you may be losing anywhere between £30 to even £50 for every £100 you spend on energy. Compare that to a condensing boiler at over 90% efficiency, and the loss is minimal. Some premium boilers like the Viessmann Vitodens 200-W are close to 98% energy efficient, which translates into the “biggest bang for your buck” as far as boilers go. If you have a broken boiler and need an urgent boiler replacement, it’s a good idea to contact a boiler company who can replace the boiler within 24-48 hours or a couple of days from you getting the online quote or making first contact. To our knowledge there are only a handful of companies online that can do this job in that timeframe. One of them is Boilerhut. Simply enter your postcode below and click/tap the green button. Our online quote is free, no obligation, and takes only a few minutes. *Please note: You will get an automated online boiler estimate. That is NOT the final price. Our firm and final quote may be different, and one of our team members will contact you to discuss any further details.